On Friday 6th April Kali from Flaming Flamingo and Shaun Beagley from Thai Curry Nights (& also Som Saa) are collaborating to bring a vegan Thai supper club to the Benk + Bo creative space in Grave Lane, Shoreditch. 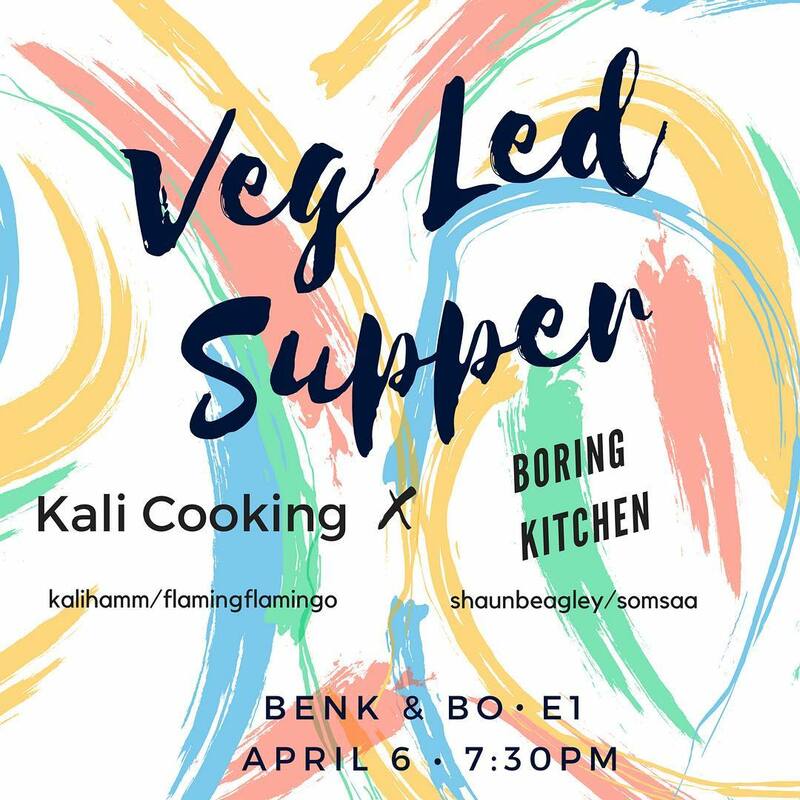 Tickets are just £35 (and it's BYOB too), and for this you get a 4 course plant-based Thai dinner, including Geng gari - Aromatic curry of vegetables with cucumber relish. Really looking forward to this collaboration! "We're teaming up with Som Saa chef Shaun Beagley aka Boring kitchen, who runs the popular pop up Thai Curry Nights. Expect to try new and exciting foods, fresh exploding flavours, all plant based. Shaun is passionate about authentic Thai cuisine, he's spent time Thailand learning the Thai cooking. Part of his time there was working in the famous Nahm in Bangkok. Kali has a passion for vegetable led cooking, flavour and style inspired by her travels. Expect fresh and vibrant foods with plenty of fresh fragrant herbs and spice. The venue is in the heart of Shoreditch opened by Mariell & Antony. Their vision was to have a creative eco-system bringing people together from different disciplines to work, make, learn, share ideas and collaborate. The Shoreditch venue opened by Mariell & Antony. Their vision was to have a creative eco-system bringing people together from different disciplines to work, make, learn, share ideas and collaborate. It's BYOB, filled with palms and plants, a l little oasis in the city. The Flaming Flamingo is always relaxed, and friendly. A opportunity to try new and delicious flavours, meet new people, and have a good time!"